Woah! What a fun session this was! I’ve always wanted to do a session in Sam Houston National Forest because it’s gorgeous and a bit more secluded that the usual spots. 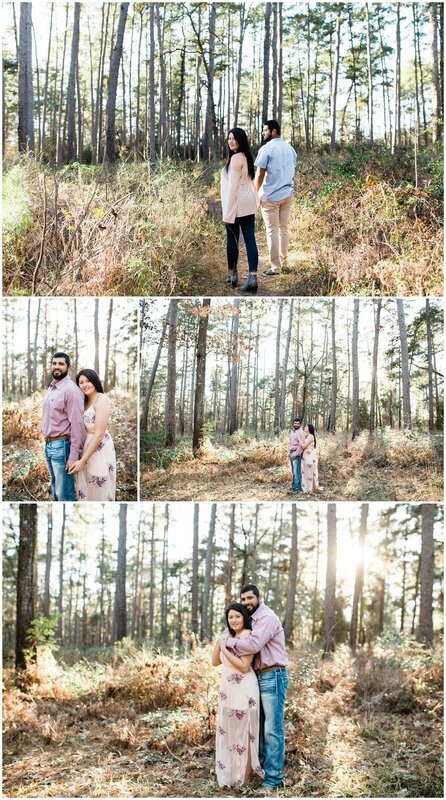 I met Jose and Brittany just inside the forest, and we didn’t have to walk very far to find some really amazing light! This spot is perfect for winter months too because the trees are pine and they’re always green. Jose and Brittany were up for absolutely anything, including walking half a mile down a bridge to reach Lake Conroe for some shots towards the end of the session. We’re celebrating these two this weekend out at Broken Arrow Ranch, and I cannot wait to see the vision Brittany has for her wedding day. From the sounds of it, it’s going to be spectacular! Congratulations you two! I know it’s been a long road getting to this moment, but I am so excited to be there with you.